Muse Paintbar has 23 locations throughout Connecticut, Massachusetts, Maryland, Main, New York, New Hampshire, Rhode Island, and Virginia. And more (including a Pennsylvania location) are coming soon! Click to find out if you're near a location. 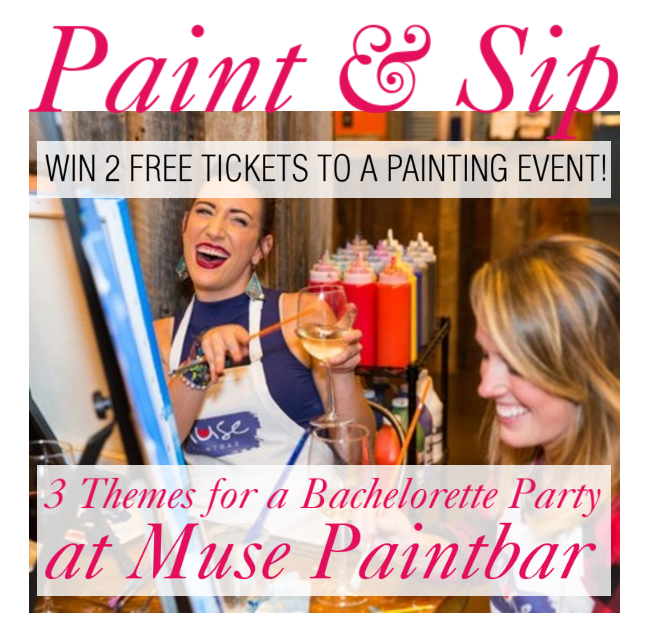 If you're within convenient distance of a location, here's your chance to win 2 FREE tickets to a painting session—courtesy of Muse Paintbar. This is the perfect excuse for a girls' night out with your bestie or something new and different to do for date night with your significant other. 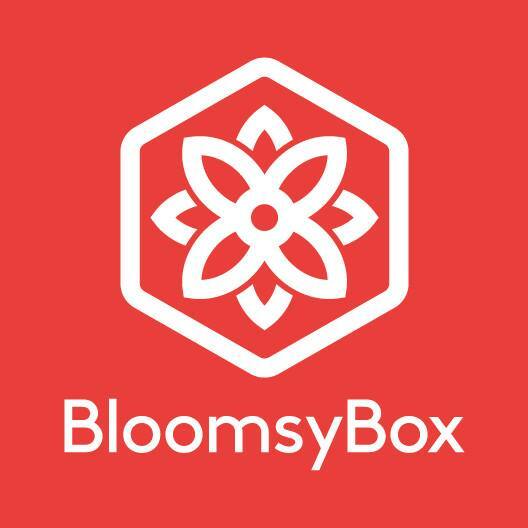 See if there's a location near you, then use the Rafflecopter widget below to earn entries via commenting and social media shares. Good luck! 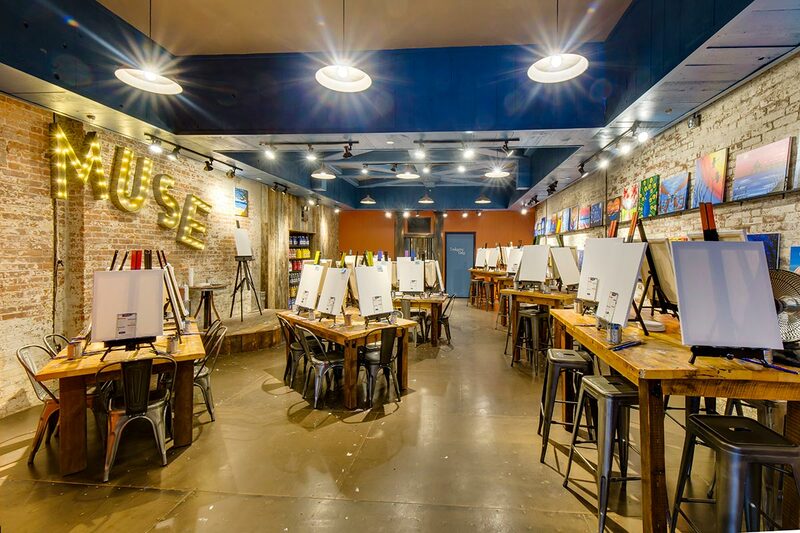 Muse Paintbar combines painting instruction with a restaurant and bar—and besides painting sessions 7 days a week, they also host private events. 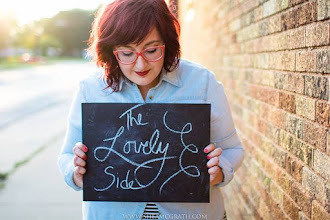 So if you're a bridesmaid looking to plan something fun and different, Muse is perfect. Every location offers a cool atmosphere and creative vibes. You can choose from paintings based on difficulty, theme, season, party type, and more. Or, have something custom commissioned for a personal touch. You're likely to work up an appetite while getting your artsy on at a paint party. No worries. You can order something tasty from the their kitchen or cater in your own food. Same goes for music—choose from one of their fun playlists or bring your own. And the best part? The bar is stocked with beer, wine, sangria, and soft drinks. 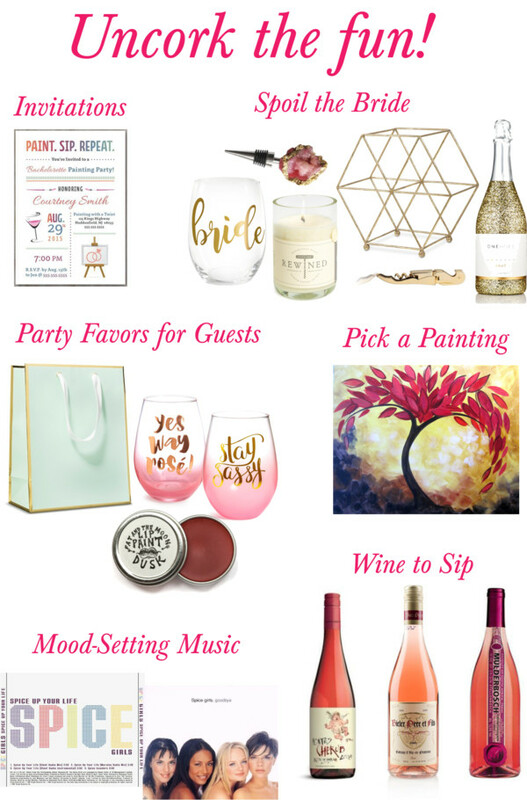 Based on my three favorites of those beverages, I whipped up three mood boards to inspire your paint and sip party planning. These are all bachelorette-based, but you could make easy tweaks to turn it into a birthday bash or other special event. Get creative with craft beer. 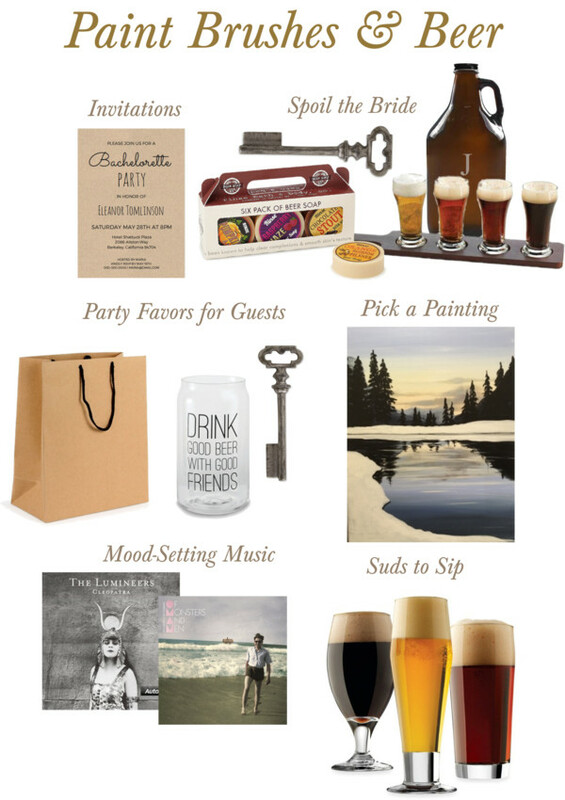 For the brewery and craft beer loving bride, keep it simple, cozy, and classy with crisp typography, neutral colors, and some indie folk playing in the background. Brown craft paper for invitations and gift bags. 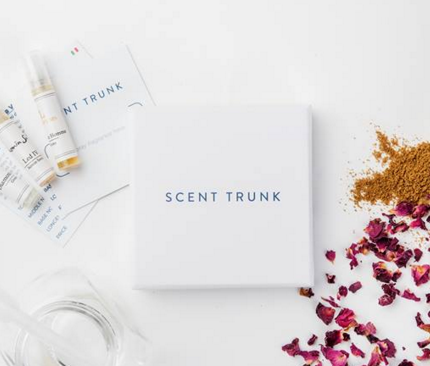 Spoil the bachelorette with beer soap, a personalized growler, her own beer flight kit, and a fancy bottle opener. Thank guests for coming with a cute beer glass and opener. Pair some vino and Van Gogh. I think out of all the beverages, wine lends itself most to inspiring creativity and artistry. Go all out girly with glitzy gold details and pretty pink rosé. Choose invitations that are cleanly and crisply designed, but colorful. Lavish the bride with a lovely wine glass, wine candle, glittery bottle of bubbly, agate stopper, and gold wine accessories, like this wire wine rack or bottle opener. Gift the guests with sassy glassware and a lip tint that gives a wine-stained look. Put on some Spice Girls for a fun finishing touch. Mmm, sangria. So fruity, tasty, and festive—perfect for a bachelorette party full of color and painting. Start it off on a colorful note with a paint-splashed invitation. Let the sangria and masterpieces-in-progress add the color, set against laid-back gray, black, and white. Play something you can sing along too. (Taylor Swift, anyone?) 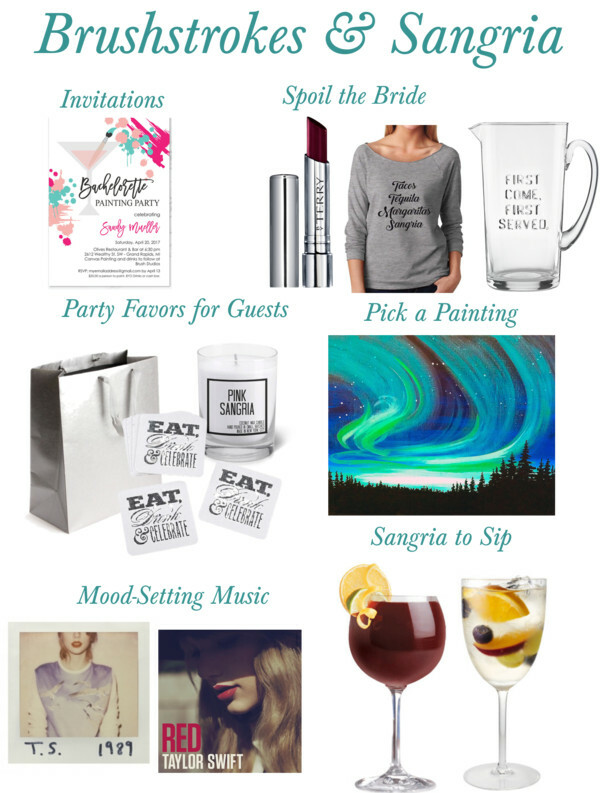 Give the bride a comfy sweatshirt naming her favorite things (sangria among them), a gorgeous lipstick in a sangria shade, and fabulous pitcher for future sangria nights at her place. Send the guests off with a goodie bag full of cute coasters and a sangria scented candle. I love muse! We had a double date at the one here in garden city (ny) and we had such a great time! I'd invite my sister in law to go to the one by us again OR head to the one in Rhode Island and invite my best friend who lives there!